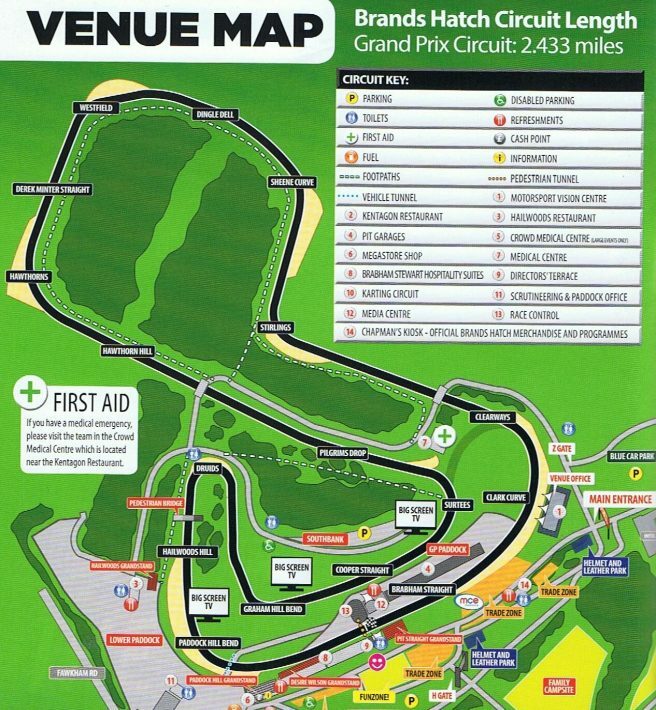 First used as a dirt track motorcycle circuit on farmland, Brands Hatch race circuit opened in 1950 and now offers two layout configurations: the shorter “Indy” layout (1.2 miles) which is located entirely within a natural Amphitheatre and the longer “Grand Prix” layout (2.4 miles). The latter is one of the most thrilling race circuits in the world with constant changes in elevation and high speeds although noise restrictions and the proximity of local residents to the GP loop mean that the number of race meetings held on the extended circuit are limited to just a few per year . 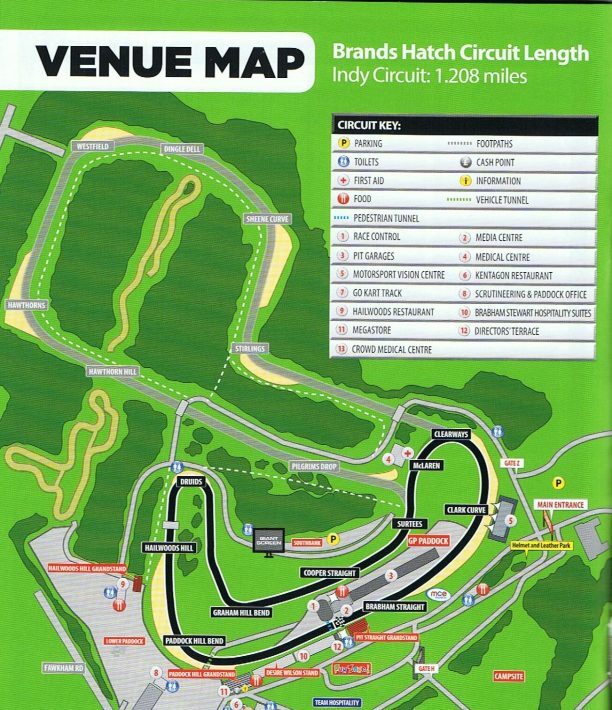 The circuit has hosted the Transatlantic Trophy Races, the World Superbike Championship (where, in its heyday, it attracted 120,000 spectators) and three rounds per year of the British Superbike Championship. Coming along the start and finish straight (5th gear, 160mph), you’re doing all you can to keep the front wheel down as there are lots of bumps and ripples trying to unsettle the bike but before you know it, you’re on to the brakes and tipping into Paddock Hill (3rd gear, 100mph) over a blind rise. That sends the rear wheel off the ground so you’re fighting that whilst trying not to peel in too early. If you do that, you’ll run wide on the exit. apex so, all in all, it’s a really difficult corner to gauge due to the blind entry but the aim is to brake as late as possible, to get a late entry, and make the apex. It’s then hard on the power all the way down the hill and then back up the other side heading into Druids (2nd gear, 60 mph) where I brake just before the bridge. I try to turn in quite early to scrub off the speed but you have to be careful not to drift too wide as that will mess up the next corner and give an overtaking opportunity to the guy behind. You then feed on the power towards Graham Hill Bend (2nd gear, 70mph) which is another tricky corner. It’s the first left hander so you need to be careful when the tyres are cold as it’s easy to highside on the way out and you don’t want to tip in too early as, again, you’ll run wide on the exit. It’s a difficult apex and a corner that you never feel totally comfortable with but it’s also a good overtaking spot as you can make a lunge up the inside and pass someone. Along the short straight (4th gear, 130mph), you then rush into Surtees at a fair pace, but you’re trying to scrub the speed of all the time because, if you start to run wide, it makes the switch to the right hander of Clearways extremely awkward. If you’re on your own it’s not so bad but when it’s in the race, you don’t want anyone to slide up the inside. I try to turn into McLaren a little late to get a good run into Clearways (2nd gear, 80mph), which is another tricky corner as the tarmac is quite coarse on the exit and it’s also quite slippery. There’s not a great deal of speed but you’ve got a terrific lean angle and it’s easy to highside so I roll the throttle on slowly and gradually build up the speed, rather than giving I a big handful. Through Clark Curve (3rd gear, 100mph), there’s quite a dip in the track and when the tyre goes off, it’s really spinning up through here and the bike gets unsettled so after about half race distance, I keep about a metre out to make it a smoother line and then get as high as fifth gear just after crossing the finish line. Overall, it’s an incredibly hectic lap as both you and the bike are constantly doing something and there really is no time to rest! I short shift into fourth over the bumps along the start and finish straight, keeping to the inside of the circuit before nicking fifth gear (160mph) as the bike moves over to the left for the uphill, blind and cambered entry into Paddock Hill Bend where it’s down two gears to third (100mph). Paddock is a great place for overtaking, either on the inside or the outside and is one of the best corners in racing. You really feel the g-force as you hit the apex and again when you hit the bottom where the suspension bottoms out and the whole bike moves underneath you. I hold third gear up Hailwood Hill keeping to the left of the track before lining up the entry for Druids. Most riders will use second for Druids but I tend to favour first (60mph) as it sets me up better for the exit where you need to be patient with the throttle as it’s easy to highside. I power out, changing up to second, and then third for the downhill run to Graham Hill Bend, which is another ideal place to pass after they changed the layout of the bend a few years back. You need to get good drive out of Graham Hill Bend and avoid running onto the kerb too much as it can easily catch you out. The bike tries to wheelie as you go from second to third (150mph) along the Cooper straight so I se the rear brake again before lining up Surtees (2nd gear, 70mph), a corner where a number of lines can be taken. I take a late apex, not too late though otherwise you’ll lose your speed onto the back straight. As you exit the corner you’re back on the gas and you have to work hard to keep the front wheel down as you head towards Pilgrim’s Drop, the fastest part of the circuit and extremely steep. You hit top gear (180mph) under the bridge before dropping back three gears for Hawthorn bend (3rd gear, 120mph), which is both a phenomenal corner in both the wet and dry and has so much grip. The uphill camber also helps you and I keep it in third along the short straight before going back one for Westfield (2nd gear, 90mph), a tricky downhill corner that’s both steep and off camber, and also important as it can set you up for an overtaking manoeuvre a couple of corners further on. I’m up to fourth gear on the run towards Sheene Curve, which has changed a lot over the years but is still blind and now taken in third (100mph). You drift out to the left but need to be careful not to go too wide as it makes it difficult to get the bike back for Stirling’s, a really important corner as it’s vital to carry the speed down to Clearways. There’s plenty of camber at Stirling’s and you can use the kerb like you would a berm in motocross but you’re soon powering up through the gears to fourth before braking hard for Clearways. Back down to third (90mph) just before the track drops away and you drift out to the left as you click back up to fourth just as the pit wall starts before hitting fifth to start another lap.